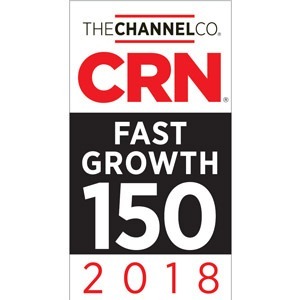 Advanced Network Management (ANM), announced that CRN®, a brand of The Channel Company, has named ANM to its 2018 Fast Growth 150 list. Moving from #16 (in 2017) to #13 (2018). This marks the third year in a row that ANM has appeared in the ranking. The announcement is one of a growing number of recognitions for ANM, including CRN’s 2017 “Triple Crown”, Other recent recognitions of note: ANM was the recipient of two significant Cisco awards: SLED Breakaway Partner of the Year Award (national), as well as the Architectural Excellence Award–Enterprise Networking across the 11-state West Area. In 2017, ANM was also recognized on a national level when it appeared on Inc. Magazine’s Annual List of America’s Fastest Growing Private Companies–the Inc. 5000 and the New Mexico “Flying 40” (both for significant growth)s. The company has also received “Best Places to Work” and “Top Places to Work” for their unique culture. Through proven technical expertise, solid financial management, and ongoing community involvement, ANM has become a recognized leader in the Information Technology industry in the Rocky Mountain region. Headquartered in Albuquerque, New Mexico. (ANM) was founded in 1994, in Albuquerque, and has consistently grown over the last 24 years. It is now the 12th largest privately held company in New Mexico. ANM has built a reputation for having the Rocky Mountain region’s top engineering talent. ANM is headquartered in Albuquerque, NM and has a 12,000 sq. ft. office there. ANM’s headquarters houses its Customer Service Center (CSC) for IT Infrastructure monitoring and support. Currently, ANM supports 400-plus customers from this service center. ANM’s engineering team carries the highest levels of engineering certifications from each of our industry-leading manufacturer partners, including certification combinations that are only matched by much larger national consulting organizations. ANM also has sales and engineering offices in Las Cruces, New Mexico, Denver, and Colorado Springs, Colorado and recently Phoenix Arizona and Texas. Ranked among the top 10 fastest growing IT Service Providers in North America, ANM has earned its reputation as a recognized leader. ANM’s revenue grew by 827% over the last 5 years making ANM the #1 Company on NM’s Flying 40 list in 2018. On top of being the topped rated engineering firm, ANM is also well known for its commitment to excellent culture & employee well-being. ANM was also rated as one the Top Workplaces in NM in 2018 by Albuquerque Journal. Based on 2017 Revenues, CRN ranked ANM as the #219 largest technology solution provider in North America.The company was also included in the 2017 Inc. 5000 list. In addition, ANM’s dedicated Security Practice, which safeguards the infrastructure of clients with customized solutions, serves as another example of ANM’s innovative and forward-thinking offerings.